Learn how to knit this cute witch's hat with this free project excerpted from Holiday Hats for Babies: Caps, Berets & Beanies to Knit for Every Occasion. This adorable witch's hat can be worn as part of a costume or on its own. If you loved knitting this project and can't wait to try more, you can preview the book and buy your own copy by clicking here. If you're looking of unique ways to celebrate holidays and special events, author Debby Ware has some creative hat suggestions in her new book Holiday Hats for Babies (The Taunton Press, 2014). The 25 projects in this book cover autumnal holidays such as Halloween and Thanksgiving, winter holidays, and just about every celebration of the year. With this book you'll be able to create a wardrobe of irresistible hats for newborns, babies, and toddlers that are both whimsical and functional. This Halloween, we're sharing a free project directly from Holiday Hats for Babies. In this book excerpt, you'll learn how to knit an adorable witch's hat that can be worn as part of a costume or on its own. If you loved knitting this project and can't wait to try more, you can preview the book and buy a copy by clicking here. Knit baby a hat that looks and feels like a real witch's hat, thanks to a stiff brim at the base and a long, wiggly tail on top. Figures for the larger size are given below in parentheses. Where only one set of figures appears, the directions apply to both sizes. The hat shown is made with Tahki Cotton Classic: 100% mercerized cotton, 1.75 oz. (50 g)/108 yd. (100 m). 22 sts = 4 in. Rnd 1: *K1, P1; rep from * to end of rnd. All other rnds: K the P sts and P the K sts. Hey, Punkin Head, Here's a Hat for You! jesdezi writes: This is excellent! I always wanted to knit a witch hat for my daughter. She is a huge fan of Harry Potter series and she loves or loved Hermoine. Thanks to you now I can surprise her on her upcoming birthday with a hat similar to this, I hope I succeed. kingcole writes: Just saw the pumpkin hat on here and this makes a great version for girls (i suppose with a colour change it could be a warlocks hat) lol. Whether you are creating a costume, designing decorations, or building your very own haunted house, find the inspiration for all of your Halloween needs here. 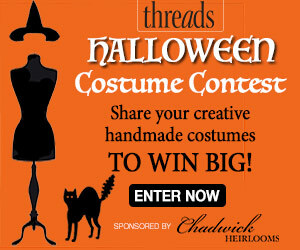 If you create your own costume, be sure to enter it in the Threads Halloween Costume Contest, before 11:59 p.m. EST, November 1, 2016 to win great prizes from OttLite and Threads.